As the first anniversary of the dreadful August 21 2013 attacks approaches, it is important review what we know for certain. Although theories abound on the internet, it is very important to remind ourselves of the information that is now in the public domain, either through deliberate disclosure or through leaks that are now well verified. Hypotheses about 8/21 need to use these facts as a basis. Any theoretical narrative to explain what happened on 8/21 must account for the facts that we already know. The following facts are firmly established in the public domain. Sarin exposure was diagnosed in blood samples taken by the UN/OPCW team. These samples were analyzed using a fluoride reactivation process which results in both high confidence and specificity. In other words, with this particular laboratory procedure we know that it was specifically Sarin in the blood samples and not some other chemical. Readers are directed to page 26 of the UN report for a description of the method and further technical references. The 140mm rocket – The Modamiyah attack, which was smaller in size and apparent effect than the Zamalka attack, used an apparent 140mm rocket. Less information is available in the public domain about this smaller rocket. Unlike the Volcano, neither the UN/OPCW team nor local people have found an intact remnant or dud. What we do have is pictures of the motor section. If the 140mm rocket was constructed similar to analogous US and USSR chemical rockets it would have an explosive bursting charge sufficient to shred the case of the rocket, leaving only fragments. 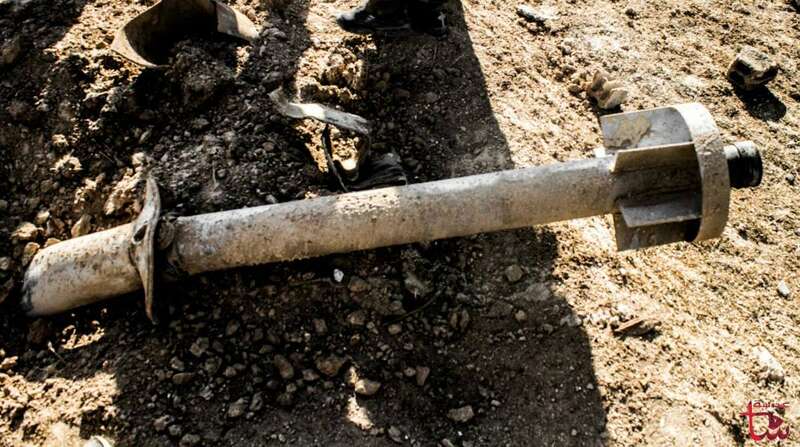 The UN/OPCW team found fragments but not an intact or even semi-intact 140mm rocket. Other interesting chemicals were at the scene of the 8/21 attacks. DIMP – The chemical diisopropyl methylphosphonate (DIMP) was found in a large number of the samples. DIMP is a known byproduct of the basic chemical reaction that creates Sarin using the DF and Isopropyl Alcohol reaction. Dimethylmethylphosphonate – This is a precursor of DF, several steps further back down the production process. It is a precursor of methylphosphonic dichloride, which in turn is used to make DF. Its presence could be as a contaminant in the Sarin left over from the manufacturing process. Methylphosponofluoridic Acid (MPFA) – This substance is a degradation product of DF. It is also a degradation product of Sarin under some circumstances. Hexamine, also known as hexamethylenetetramine. This was found in numerous field samples at the sites investigated by the OPCW/UN team. It has numerous industrial uses. However, up to the point of the UN report, it has had little or no published use in chemical warfare. The fact that it was specifically reported as an “other interesting chemical” in the UN report. DF – No DF was present. This is not surprising as the vapor pressure of DF is quite high and any residual DF would have either degraded or evaporated. This is expected given the period of time elapsed between the attack and the site visits to collect evidence. Isopropanol – Again, some isopropyl alcohol might have been expected immediately after dispersal, but as this is quite a volatile substance. Other Amines – No other amines were found, including isopropylamine. Once again, many amines of possible use as additives would likely have evaporated given the elapsed time. Amine-HF complexes – No amine-HF complexes, such as hexamine-HF salts, were noted. Various inferences can be draw from the lack of these particular substances, which I will address in later articles. Syria deposited its “Instrument of Accession” to the Chemical Weapons Convention on 14 September 2013. Syria made declarations to the OPCW as part of the process. While the full declaration has not been released into the public domain, several salient facts have emerged. A significant inventory of precursors, additives, and feedstock chemicals was declared. Many of these chemicals were listed in an OPCW document in November 2013. Interestingly, this document listed 80 tons of hexamine. There was a non-trivial waste stream associated with the chemical weapons program. There same document listed nearly 8 million liters of waste effluent from chemical weapons production. This is indicative of very significant production activity. Other interesting information has slipped into the public domain through other outlets than official UN/OPCW documents. The chemical demilitarization project being undertaken on the American ship the MV Cape Ray is not handling actual Sarin, merely the precursor DF. This is another admission that the nerve agent arsenal in Syria was maintained in the form of binary components, not as finished agent. On 13 December 2013, Ake Sellstrom and Scott Cairns, head and deputy respectively of the UN/OPCW team that collected the evidence, gave witness testimony that was recorded by the US TV network C-SPAN (link). In their statements, it was revealed that hexamine was possibly used as an acid scavenger in the Sarin used on 8/21. GW – Why was hexamine on the list of chemical scheduled to be destroyed – it has many other battlefield uses as well as sarin? Did you request to put it on the list or had the Syrian’s claimed that they were using it? you mean that Sellström told CBRN “Hexamin is part of the syrian Sarin formula”. The Interview even does not include the phrase ” acid scavenger” or the wordes “Hexamine” / “formula” eta all. 2.) There is no source to find in the whole internet with an Sellström-Interview including this phrase. The interviewer, Gwyn Winfield said the question and answer was edited from the CBRNe World interview, but confirmed the exact quote and that he had it on tape. There ist no phrase “acid scavenger” to be found in the hearing. But there ist a different theory about the hexamine in the hearing — it can be a trace from RDX a military explosive. Nobody in hearing says that hexamine can be a ”acid scavenger” in the sarin production oder a ”acid scavenger” in a “binary sarin weapon”. points to the [Syrian] governement. Or my comments are filbert on keywords like hexamine, mustard gas etc. 3 post deletet in no time — bug or filter?